The Malayan Lascar is one of four lookalike species found in Singapore, and probably the commonest of the four. 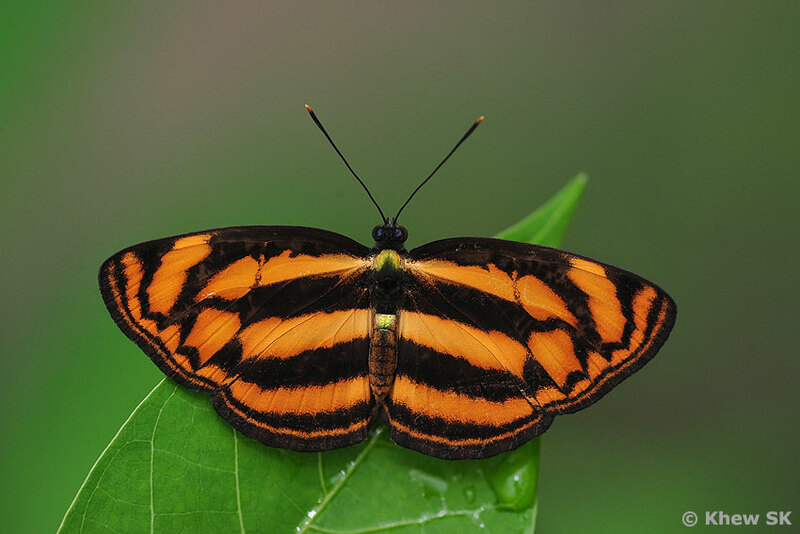 The typical black and orange striped appearance and similar sized species - two from the genus Lasippa and the other two from the genus Pantoporia make these lookalike species challenging to identify when in flight. Only when they stop to sunbathe or rest can the identification be made more confidently. 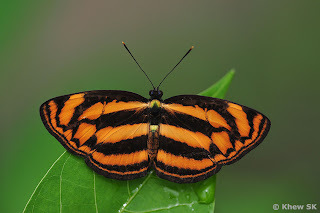 The Malayan Lascar can be separated from its lookalike cousin, the Burmese Lascar by the sub-marginal spot in space 3 of the forewing above, which is about twice the size of the adjacent spots in space 2 and 4. This pristine Malayan Lascar was shot at a patch of secondary forest near Bukit Batok in Singapore. The species has a weak flap-glide behaviour and is fond on settling on the upperside of a leaf with its wings opened flat. However, like its other cousins, it is a very alert butterfly and unless it is feeding and distracted, is hard to approach. Once startled it makes its way to the treetops quite quickly and out of reach of the frustrated photographer.